Here we go again! 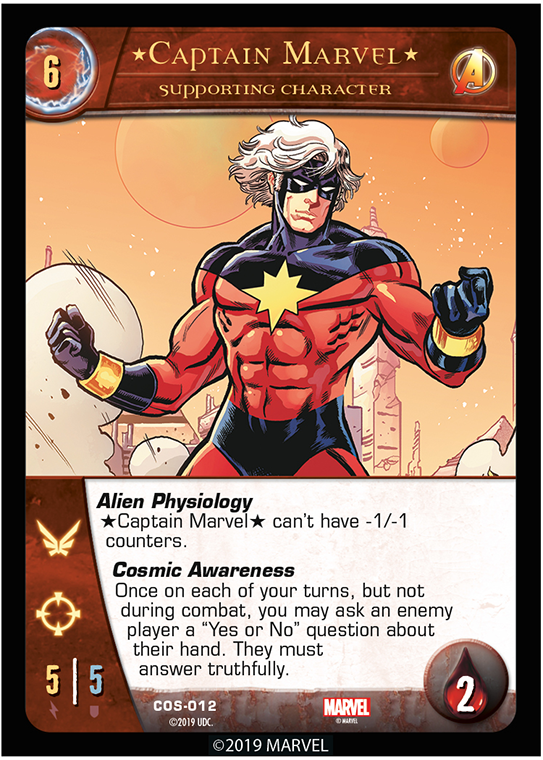 More preview cards for Cosmic Avengers, the first Issue in the Infinity War Story Arc for VS. System 2PCG! But alas, it’s our last look at the set. Let’s get right to it! This one is full of power! Hey, there he is, the Kree also known as Mar-Vell! Remember, the *s around his name mean he shares a mantle with another Captain Marvel. So they can both be on a side at the same time, but they can’t be used to Power Up each other. Well, nothing to talk about for him! On to the next…what’s that? Our lawyers are telling me I have to say something about his Cosmic Awareness power. Ok, here goes: It’s great! Ok, here we go for real! This power allows him to ask an opponent one concrete question about their hand. “Concrete” means it must have an objective answer. You can’t ask “Do you have a good hand?”, for example. And the answer must be truthful. In a casual setting, use the honor system or a bystander to help out. In a more formal setting, you can ask a judge. But what about Carol Danvers? Well, there’s this! 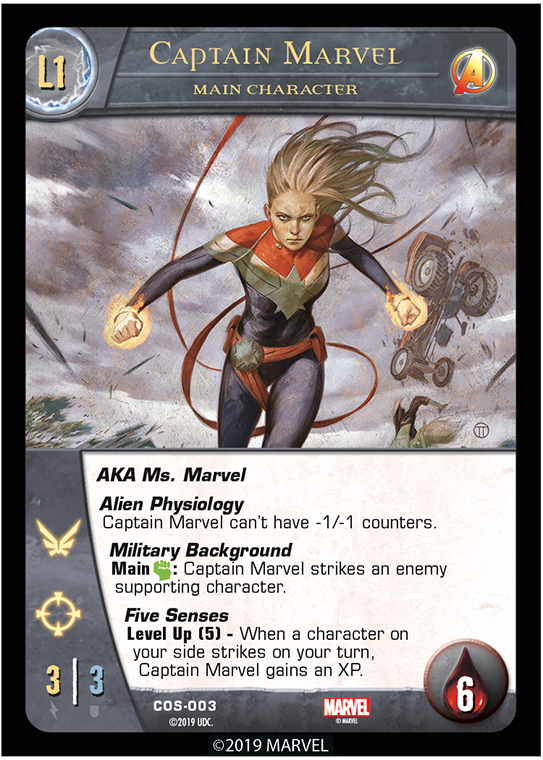 The Tyrant of Tractors herself, Captain Marvel! Remember, her Military Background power allows her to strike – but whomever she strikes doesn’t strike back, it’s not a combat! Her Security Background power lets her strike as well, but as a Reaction after an enemy supporting character appears. You may have noticed that she can level up again. Whatever could she do? Note that her Seventh Sense power works when attacking and defending. Now that we’ve seen this powerhouse, let’s look at some characters who could go toe to toe with her — the Eternals! 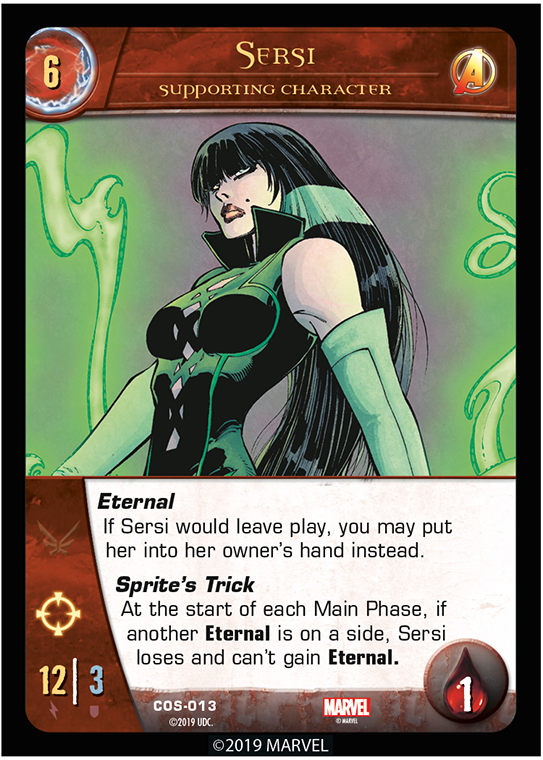 Note that Eternal trumps not just KOing, but also removing from the game, and any other way the character would leave play. 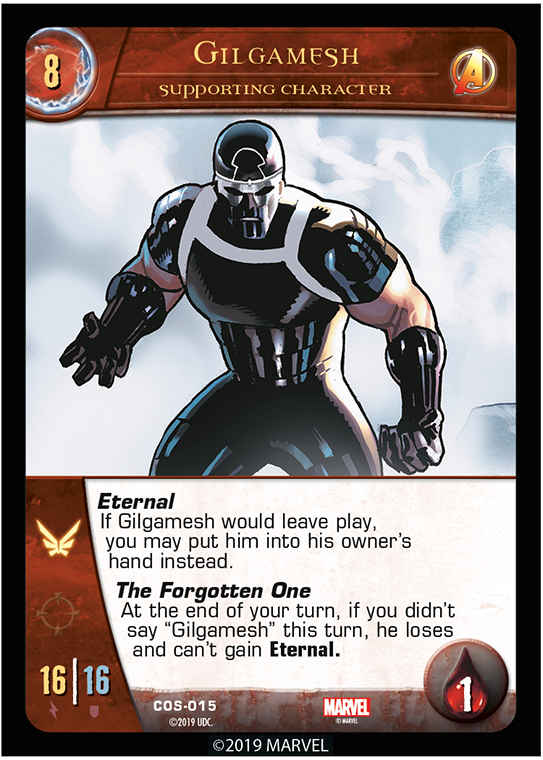 These darn Eternals just keep coming back, unless they lose Eternal somehow! They do all have built-in ways to lose it, which is lucky. Keep in mind that when they lose it this way, they lose it until they leave play, not just for the turn. 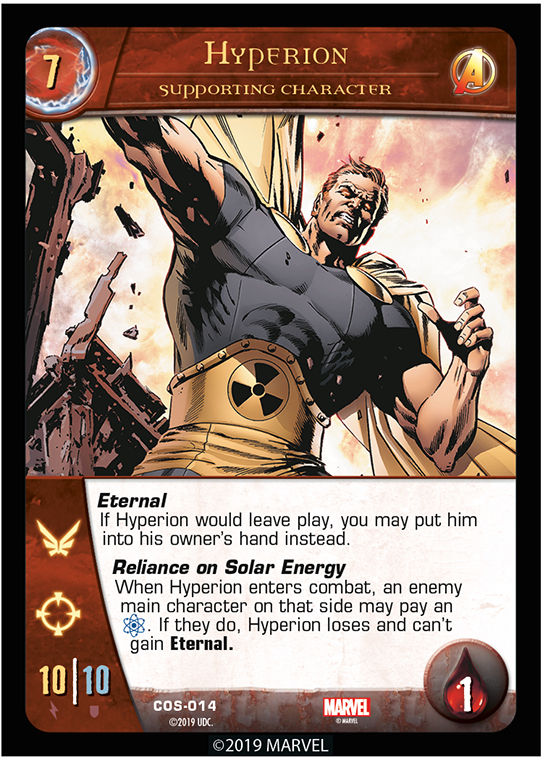 Also note that Hyperion’s power is like *Thor*’s from last preview – it’s not a super power either – except that a face-up enemy main character can pay for it. We hope that you liked what you saw in these previews! We sure liked typing the words that you may or may not have read that went around the pictures! See you soon, for a galactic good time! 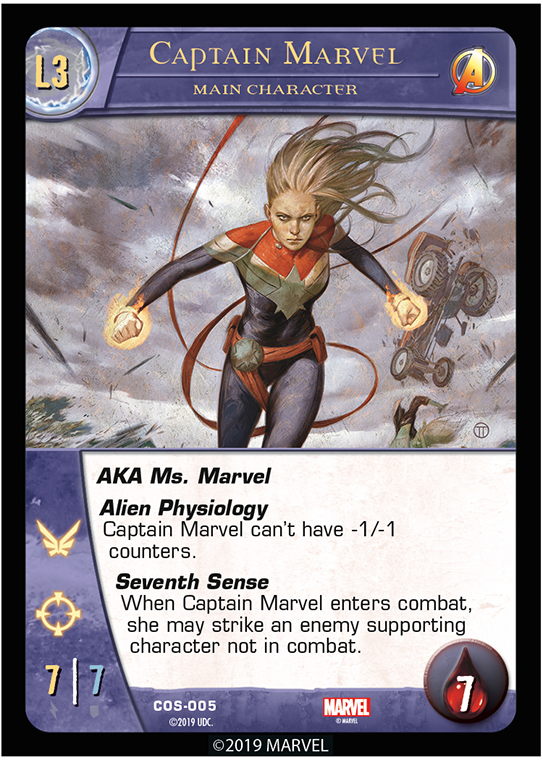 Thanks for checking out our second card preview for Vs. System 2PCG Cosmic Avengers. Be sure to pre-order it with your FLGS. It will be available February 27th 2019!